Kids will love these no doubt. 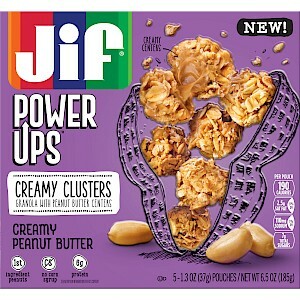 They really have a great mouth feel with the crunchy granola and creamy peanut butter inside. Peanuts are the first ingredients just as it says on the package - but sugar is number two! One bag is 190 calories, 11 grams of fat, 110 mg of sodium, 7 grams of sugars, of which 6 are added sugars, and 6 grams of protein. Nice to see innovation in this category.